On a summer's day in June 1982, a helicopter delivered Pope John Paul II to 300,000 enthusiastic pilgrims waiting at Glasgow's Bellahouston Park. Among that crowd stood 20-year-old Philip Church. Twenty eight years later, he will again stand in the same park, this time with his wife and seven children - and 100,000 other Catholics - to welcome the current pope, Benedict XVI. It is the first public event of a four-day visit - the first ever state visit by a Pope. Memories of 1982 are still fresh in Mr Church's mind, especially as he has been trying to "build up some excitement" for the coming day among his younger children. The highlight for the youthful Mr Church was being able to see the pontiff for himself. "He went past in the Popemobile quite close to where we were. Obviously we could hear him [during Mass], but to physically see him was the best part. It was about being part of history when history is being made." He enthuses about the feeling of community he hopes will permeate the event, a bit like a larger version of meeting fellow parishioners after Mass on a Sunday in the church porch. It was a strong memory - one of public unity - he took from his youthful experience and he hopes his children will have similar memories. But critics, such as the umbrella group Protest the Pope, have raised objections to the cost of the state visit - currently estimated by the government to be as much as £12m - as well as to the Catholic Church's teachings and actions on issues such as homosexuality, HIV and sexual abuse by some priests. The Pope himself has been accused of being part of a culture of secrecy, and of not taking strong enough steps against paedophiles when he had that responsibility as a cardinal in Rome. The Vatican has strenuously denied the claims, but protesters are expected at the UK events. But Mr Church espouses a tolerant attitude to the Church's critics. "Unfortunately, people are moving away from God, and so security has to be increased. Some people want to cause havoc. They have a right to be there, and a right to object. "But I predict the day will go off without a hitch," says Mr Church. Security will be strictly controlled, pilgrim passes have been distributed to parishes throughout the UK, no candles, musical instruments or glass bottles are allowed in the park, and pilgrims must arrive by coach only at the venues outside London. In Birmingham on 19 September the focus will be the beatification of Cardinal John Henry Newman. Ann Hill will be there, having risen at 0400 BST to make it from St Albans for the Mass six hours later. 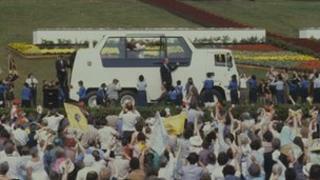 She was among the 80,000 faithful who gathered for Mass at Wembley stadium in 1982. They sang He's Got the Whole World in His Hands, and clapped their hands as Pope John Paul II toured about in his Popemobile. "It was great," she says of the outing with her sister, nephews, and fellow parishioners. "It was very uplifting." Advice to pilgrims warns them of long walks from the coach parking area to the venue, plus hours waiting around. "It's not going to be quite so easy as Wembley. It will be a long day, there's no seating, as far as I can gather we're just in a field, so it's more of an undertaking. I think that's why a lot of older people aren't going, they haven't got the stamina." For Mrs Hill, 59, it's about being part of an historic religious event: "How often do you get a chance to attend a beatification Mass said by a Pope?" Long walks and longer waits are a prominent memory from May 1982 for Andrea Smith. Living in Ashby-de-la-Zouch, Leicestershire, she woke her young son, Gareth, and daughter, Katie, in the middle of the night to get them onto a coach for the trip to Coventry. A photo shows the two children, 8 and 7 years old respectively, looking a bit miserable, but she says they were very excited about seeing the Pope. The arrival of 350,000 people at Coventry airport meant hundreds of coaches parked along the A46. They had seen dawn break while on the bus, and then had to wait until noon for Mass to start. It finished three hours later. The pontiff's arrival by helicopter and then the Popemobile circuit had the crowds cheering and waving flags. The day was hot - "we just didn't expect that, it was May" - and Gareth ended up in the St John Ambulance first aid tent, but quickly recovered. "It was an exciting day, and we were so exhausted, but I have good memories," she says. Mrs Smith is no longer a practising Catholic, but doubts she would have been as keen to see the current Pope if she was. Reluctant to comment too much on Benedict, she does say that "he doesn't have the same charisma" as John Paul. But Benedict's role as "a point of unity" is a key feature of the visit for Ryan Service, a 22-year-old Birmingham Catholic youth worker. "This has been a dark, dark horrible year, but this is a beacon of light to reflect on the Church in England and Wales," he says. "It's a recognition of what the Pope represents, a point of unity. It reminds us that we have a Christian heritage, and that it is something to celebrate and to take pride in," he says. "I probably won't even see him, but just a glimpse will be enough. It's a privilege and an honour to have him in the country." Mr Service will travel to London for events at Westminster and Hyde Park on 18 September, then back to Birmingham that night before waking for the Sunday morning Mass. "Some people my age have chosen not to go because they think that faith is private and they don't want to be show-offs about it. "But I think it's not to be hidden," Mr Service says. Even sleeping in a school hall in London and then a tent during autumn in Birmingham will not dampen his enthusiasm: "It's not all hard work, you've got to enjoy it - and survive the weather."